Yesterday only i have finished my CMA. I have cleared my CMA in first attempt.Now I am CMA Kaustubh Patel.Here i am sharing with you the Success mantra of clearing the CMA in first attempt. The success mantra of my is 3P, Planning, preparation and Presentation. 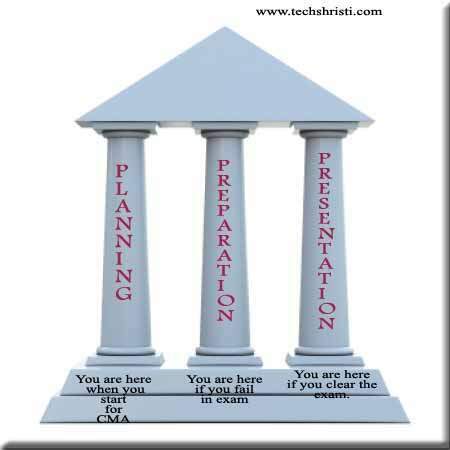 Yes, this 3 Ps are the pillars for clearing the CMA exam. Never start your preparation before planning for it.I had spend around 75% of my time in planning and rest 25% for my study. Second, after planning start preparing for your exam. At Last and the most important, Present your exam papers well in exam.Presentation make the difference in the exam. Many of us complain that friends i have really work hard for my exam but did not clear it. The reason is presentation, you have work hard but you do not know how to present yourself in papers. It is very important that how you write your paper.The handwriting, every new question must be start from new page etc. I was very chussy about the this all. So friends, gave equal importance to 'Presentation', I am sure you will clear the exam in first attempt. Generally, the sequence must be Planning (75%), Presentation (20%) and preparation or study (05%). Thank you @ Kaustubh Patel. Your tips would be helpful to many students to clear the exam.